Racquel Writes: Make Time for Your Writing this Weekend! Make Time for Your Writing this Weekend! 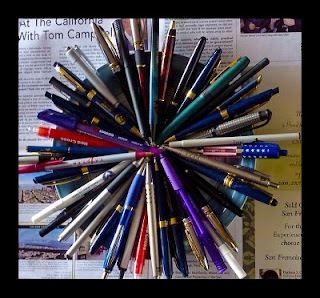 This Weekend I am encouraging everyone to pick up your pens and WRITE! We all say it. We are too busy to write, we don't have time, we have to work, we have to take care of the kids, the list goes on and on. But we CAN make time! Even if you can just set a side an hour of time this weekend, just do it. It might take you a little longer to finish that short story, or novel in progress, but at least you will be moving forward and not staying in the same place. Leila has never had her heart broken until last night. She buries her head in her pillow and cries. Every beat of her heart beats with pain. Often the pain can stop her breathing. She wonders what to do next. Could it ever be fixed? Her eyes are burning. She is exhausted. It's over. Finally. Ok everyone get to it! This weekend I will finally start my novel! Look out for an excerpt during "Teaser Teusday!" Keep writing! Very inspiring post! And I was proud of my result from the writing exercise as well. Yours is really good- you should be proud :) It is a really helpful exercise. I think I might try it again soon. Yay! You're starting your novel! :) You motivated me to stop procrastinating and just start writing this weekend--even though it's already Sunday afternoon. I could get a few words done still, right?